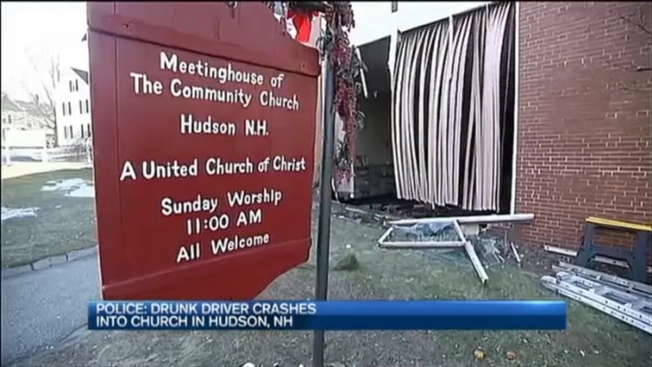 Police in Hudson, New Hampshire, responded early Monday morning to a report of a vehicle in a church. Upon arrival it was learned that a 2004 Jeep Liberty had driven through the plate glass window of the Hudson Community Church on Central St.
A preliminary investigation reveals the SUV was traveling west on Central St. and failed to negotiate a turn on the street. The driver lost control and initially struck a lolly column which supported the main entrance into the church. The lolly column became detached and the momentum of the vehicle caused it to crash through a large plate glass window. The driver, who was identified as Eddy Garcia, 47, of Nashua was uninjured. He was placed under arrest for suspicion of driving while intoxicated.